Today we are going to discuss how you can grow Transplants (seedlings) in your house and use it to grow plants instead of growing directly from the seeds. Now, you must be wondering why we should take the pain of preparing transplants when we can easily grow plants directly from seeds. So let me tell you this, there are two major advantages of growing transplants instead of growing plants directly from the seeds. Firstly, it drastically reduces poor germination possibilities. Unlike directly growing from the seeds in this case proper care is taken to every seed so that each of them gets most favorable condition for germination. So the seed wastage is greatly reduced. Secondly, when you transplant the seedlings to the permanent spot where they are meant to grow chances of survival of the plants are increased greatly as they become adaptive to the climate outside. It most of the cases when we grow from the seeds this is the time when most of the plants die as they try their best to adapt to the surroundings. To prepare the transplant you first need to have high-quality seeds. You can buy from your nearby nursery shop or you can use your own. The seeds from a commercial supplier are generally are of superior quality as it is prepared under professional guidance. If you are planning to buy the seeds please refer to the dates mentioned in the packet while buying. The next thing which is very very important in transplanting is the media or the soil. Different media are used, to prepare the transplant. But while choosing, remember it should allow air and water to reach the seed, and it should provide nutrition in those early times. The next question is should you use sterile or normal media. Well, in most of the cases the media used by professional gardeners are sterile in nature. It reduces the chance of fungal or any other diseases. You can easily find sterile media from your nearest garden shop. One of the major drawbacks of using sterile media is that it contains almost no nutrient. So you need to transfer the seedlings in early stages or they would die. Once you have finalized about the seeds and growth media it is now time to select the containers. 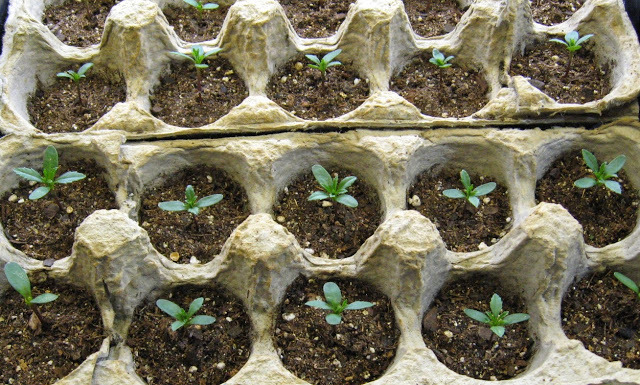 The most popular are plastic seedling trays. This form is widely used by the gardeners and nurseries across the world. It can save you lots of time and space by selecting these them than going for individual pots. You can also choose to use used egg cartons or paper cups. Sometimes tiny pots made up from peat moss or coconut coir is also used. Now that you have selected your final ingredient, put some mixture (growth media) in every pot or compartment of the tray, sow the seed and cover it with some mixture. Add a little bit of water to keep the mixture moistened. Keep the tray in a place inside your house and wait for the seeds to germinate. Once they germinate, put the tray in a place where the tray gets sunlight. It will ensure proper growth for the seedlings. After two to 4 weeks (depending on the plant and the size of the seedlings) transplant them in their permanent spot.